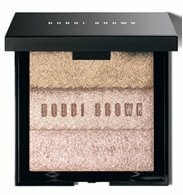 The Bobbi Brown Shimmer Brick is a compact luminizing powder, usually with three to five horizontal stripes of different, but complementing, hues. "Luminizers" give you an all-over pearlescent glow, subtler and less noticeable that glitter. Luminizers come in liquid, cream and powder forms. This is a compact powder, making it easy to bring with you in your purse or on your person. These Shimmer Bricks come in five different color palettes: beach, beige, bronze, nectar, pink quartz and rose. What palette you use depends on your skin tone. Makeupalley users give the product a 4.3/5 rating. "[Bronze color] Looks great on olive to dark skin tones," grayeyes043 reported, "and it looks great when you want a natural glowy look with toned down makeup." Others were less enthusiastic. "This has soo much sheen/glitter it was like glitters galore," kathrynb23 wrote about the rose-colored shimmer brick. "Barely [any] colour showed up at all, either as blush or eye shadow. The glitter just over powers everything." Buy Bobbi Brown Shimmer Brick at Amazon.com .